There is always a group of people who like to dress in all black. In these cases the outfit pops from the background if the silhouette is interesting. Like in this case: lots of volume in upper body and thin stick-like legs on bottom. Note the beanie. This mohair fluffy beanie style continues to be popular the second winter in a row in Helsinki. Just look at this. >> Posted last winter. Where is the sun? For many days this has been an essential question here in Helsinki Finland. Grey days are the norm at the beginning of the year. 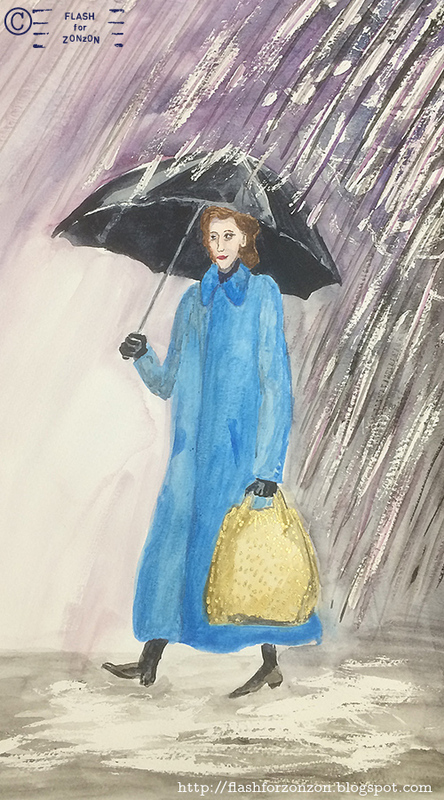 Therefor, when this lady walked toward me on one of these grey days, I thought she was carrying the blue sky that was caught in her jacket, and she carried the sun in her golden bag. 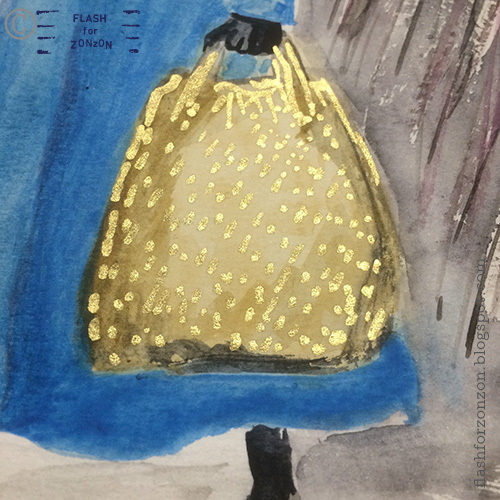 Oh, the bag was glittering! It’s up to her, when she decides to release the the two, sunshine and blue sky. I’m just waiting. On the Street. Pattern Mix, Kellohalli, Helsinki. I saw this guy already in October. He came to my mind now, when there is a lot of talk in media about our behavior in buying things, consuming in sustainable way and how fast-fashion effects negative way to climate change. One resolution for the need of new clothing is flea market. If you want avoid buying from fast-fashion stores, flea markets are a viable alternative if money is scarce in use. Because if you find a second hand piece of clothing in good condition, you can rely it will resist the ravages of time in the future too. I went to sell stuff in Kellohalli flea market. This guy was leaning to wall, seemingly looking at phone, but ready to observe if anybody would notice him. I noticed him, yes, because everything in the colour scheme and checkered patterns were carefully thought and combined together from flea market finds. I had a chat with him and told he has a nice outfit. Willingly he told me, that he had sewn the jacket from two different jackets and showed his back and the back seam, where the two different fabrics meet. I was wow, what dedication! Ten points for you, young man. 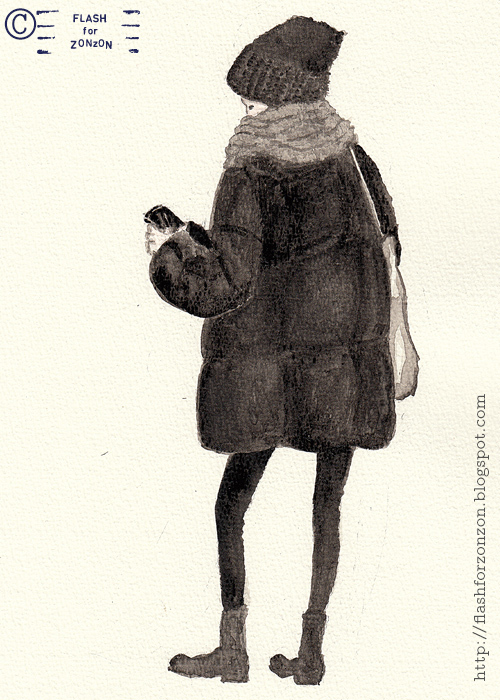 I saw this girl three weeks ago, drew two weeks ago and now live in blog. This is it, the impossible circle in life of mine. Too little time for free time activities. But I do my best and post here irregular on regular basis. But isn’t this girl something! The eye makeup and the amount and volume of black colour really turned my head. 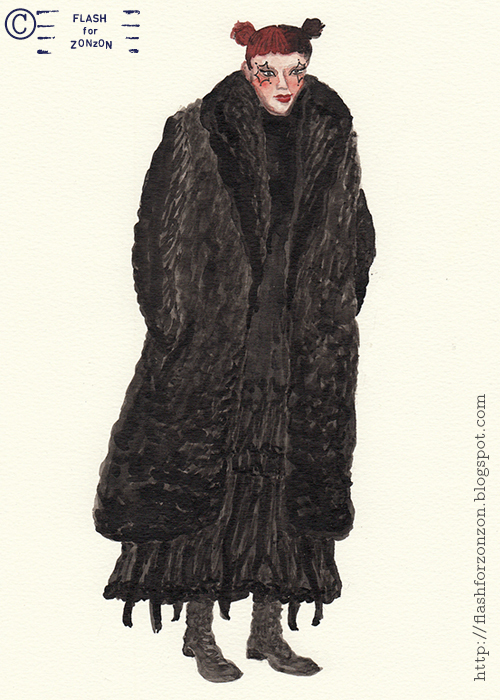 Fur and layers. Red and black hair. Something to draw with ink! For fun. Remedies Towards Dark Season. In Finland in this moment Autumn days get shorter and darker towards the end of the year. Outside there is cold, rain, snow. At this point of the year it is great to have some inspiring sources of light and green energy indoors. 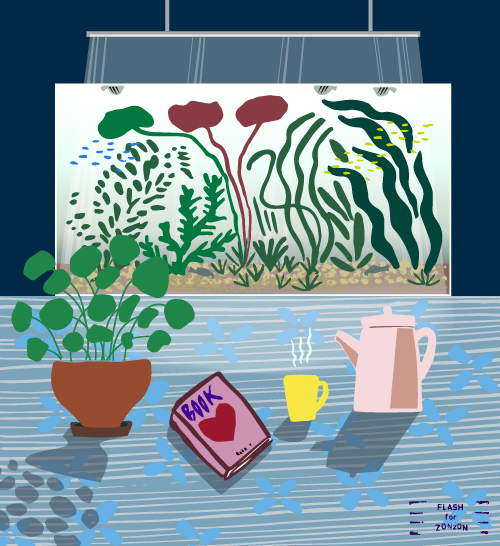 Aquarium – cube of light and house plants make the perfect surrounding. When you add a pot of tea and a good book you are alright whatever is the weather outside. This is my submission for Doodlers Addicts meet Adobe Stock challenge. This time the topic is Home Sweet Home. Do you share my love and remedies towards dark season? If you like to see what other illustrators have in mind on Home Sweet Home in Doodlers Addicts, go for it. You can also pick your favorites and vote! On the Street. 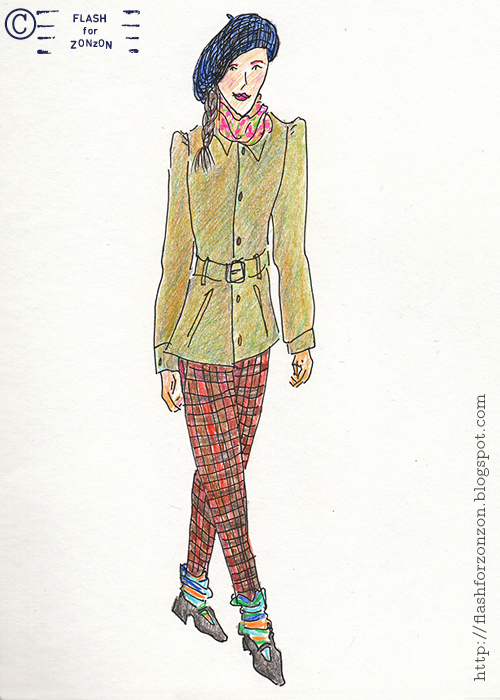 Autumn Style Doodle Found from Sketchbook, Helsinki. This is a style found from sketchbook. Doodled, I don’t remember when. Seen in Helsinki, anyway. 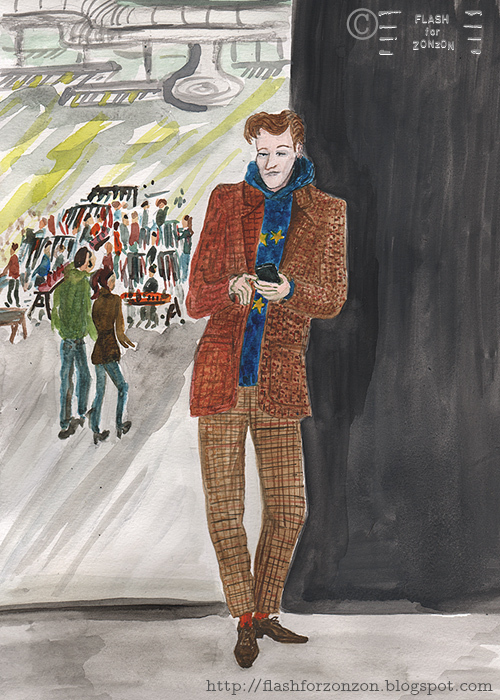 Obviously, this is autumn outfit. Could be seen now on the street. Striped wool socks and loose beret on the head. Somehow this style feels coming from the past. The mix of stripes, floral scarf and plaid is wonderful. For Fun. On the Streets of Helsinki. For a change, let’s have a look around Helsinki, the place where all the characters of this Helsinki Street style Blog hang around. This image is my response to the latest drawing challenge in Doodlers Addicts. The drawing task was Urban Explorer. As determined: For the Urban Explorer Drawing Challenge, we'll focus on illustrating cityscapes, houses, architecture, or other urban settings that are too perfect to pass up. That suits to me, I live in Helsinki that has many faces and lovely places. 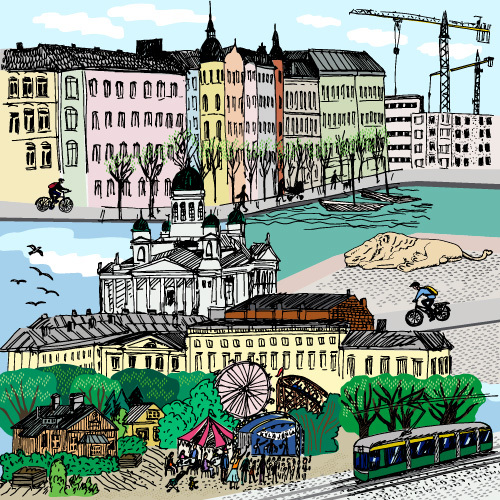 I wanted to show different aspects of Helsinki in same image. Probably everyone who visits Helsinki passes the Helsinki Cathedral at some point. If you look around there is lovely selection of colours and details in buildings in Center. And of course, in a developing city there is always some construction work going on. But I am glad that there is also some old parts of the town, where wooden houses have been in the place for decades. 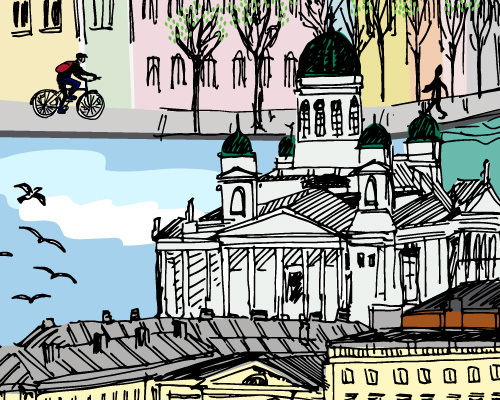 Helsinki is just big enough to give surprises and small enough that it is easy to explore it by foot or bicycle. Helsinki green tram is an option and it offers a great way to look the street life and different parts near City Center. Helsinki is surrounded by sea and it gives a special character to the town. In summertime there is lovely happenings around the city in parks. For Fun. 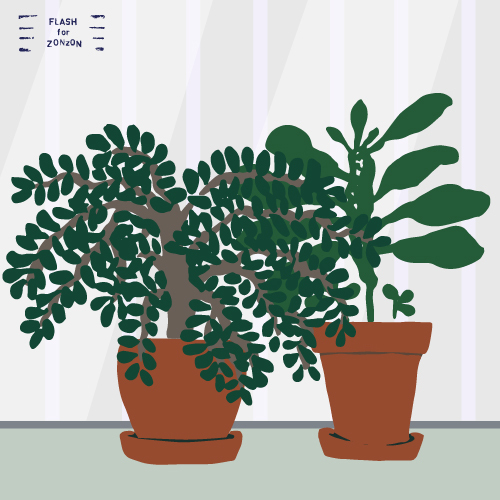 Taking Care of Houseplants. I know, I know. Lately, it’s been quite silent here in Flash For Zonzon. Let me explain. Too much everything in life. One thing of this bundle of everything is houseplants. I have hopelessly lost my mind and soul to houseplants. The increasing amount of plant pots causes the increasing need of care of these green friends. The number of species is growing and the size of my darlings is getting bigger. It is a chain reaction that causes the need to repot plants to bigger pots. All this hassle takes time from other free time activities, like drawing. 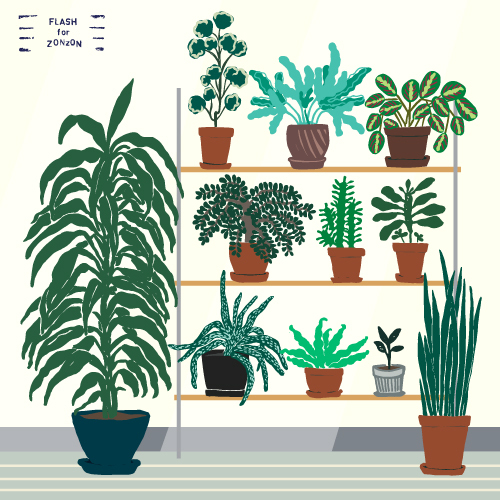 I joined a Finnish Facebook group of House Plants. Boom, the amount of knowledge in the group thrilled my brain. I have learned about the different types of breeding grounds. Before it was just a regular sac of soil carried from grocery store. Well, nowadays my plants have different mixtures of coconut fiber, perlite, vermiculite, pine bark, rough sand, leca substrate, moler clay. Every plant type has its own typical need for ground and light. I have realized that there is point on finding out the care instructions of different plant types. Plants thank you by growing beautifully. And that is the magic! Also, how it’s said, knowledge increases pain. Before I was totally ignorant of the enemies of houseplants. Species of insects like harmful mites are many who love to consume the wonderful greenery. Just in a concrete way. Now and then there is need to use some power against pests. Anyway, I like to use natural methods. This image is made for Doodlers Addicts drawing challenge. The topic was Mother Nature. As much as I love to wander in woods I decided to illustrate my plant friends. We in Finland has this long dark period called winter. Especially in those dark days it is precious to have the green vital plants at home and workplace. It really gives energy. The effect of living plants at home is sure more effective when you live in the weather zone where half of the year there is no leaves on trees. When I visited Spain, I felt myself become fools seeing all the plants we care so tenderly indoors, growing wild and happy outdoors. A ten-meter-high ficus compared to my meter-high-ficus elastica. All the plants in this image live with me. But these are just part of them. Maybe I’ll illustrate them all later… Good idea!? Many of the plants has been years with me, like twenty or more. We grow together. This money tree is one of them. And Euphorbia leuconeura, Madagascar jewel, has lived with me as long as I can remember. This or the children of the original plant. I keep on growing new little Madagascar jewels and give them forward to human friends. On the Pier. 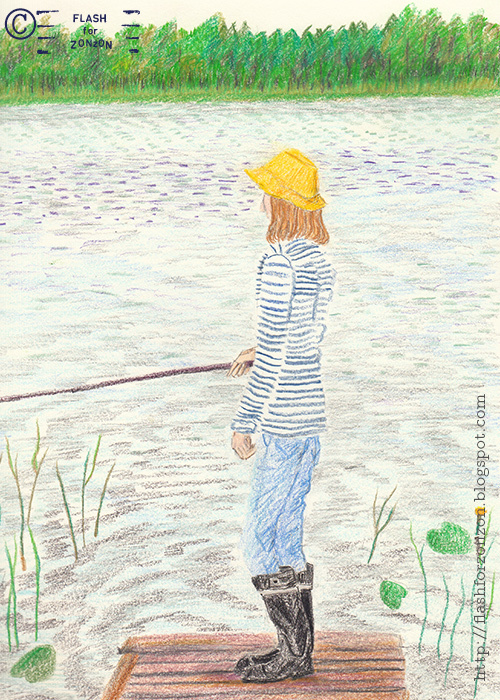 Summer Fun, Angling. Greetings from the Summer Holiday. It’s been a while when I last posted anything here. Spring was so hectic in work I didn’t have any time for this poor blog. Too bad. Then came the blessed summer holiday and the cottage life in Finland countryside. The countryside life is surrounded by nature. That includes angling and fishing, eating the fish caught from the lake and blueberries from the woods. This year we had a lot of sunshine and it was a pleasure to jump into the lake swimming several times in a day. Rare delicacy in these levels as Finland. I haven’t seen much interesting street style lately. 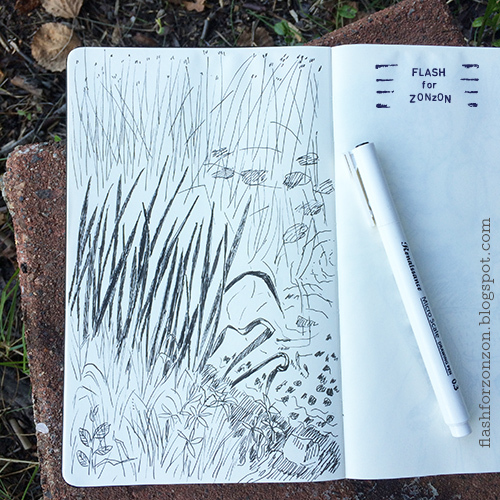 Therefor I’m sharing some images from summer sketchbooks. In the image above is my daughter angling. Dressed in all time classic Nokia Kontio -rubber boots (first pair made in year 1973), jeans, striped shirt and to the top yellow fisherman’s hat. The color of the hat fits perfectly with the yellow waterlily. Simple life barefoot, sleeping in a tent to avoid mosquitos. In the evening it was a great pleasure to fall asleep listening the sounds on nature, wind, insects, birds, bees. This is the best way to reduce stress levels in life. On the Street. 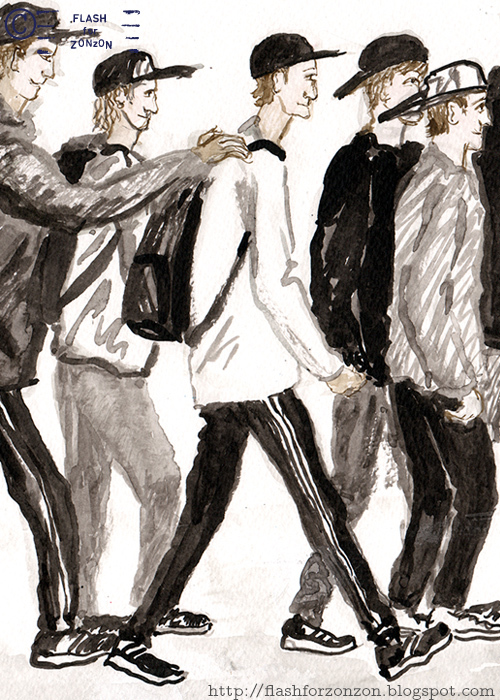 Boys Boys Boys, Helsinki. Spring feeling in this group of boys. The caps are pointing forwards and backwards, colors and style like uniform, all black, white and grey. Perfect harmony and good mood. 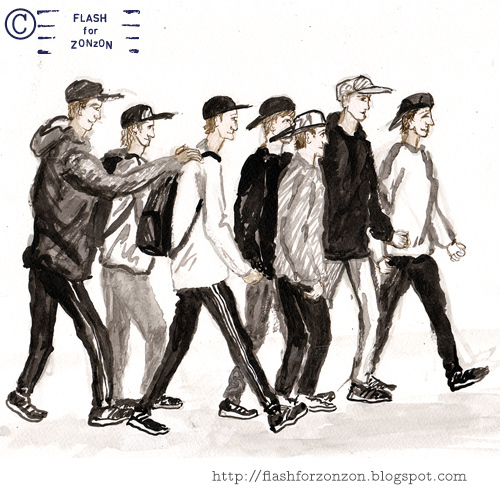 Flash For Zonzon is illustrated blog about fashion, Helsinki street style, interesting surroundings, patterns and more. On the streets I see fab styles. I’m saving the looks to my mind. Later on I draw them. 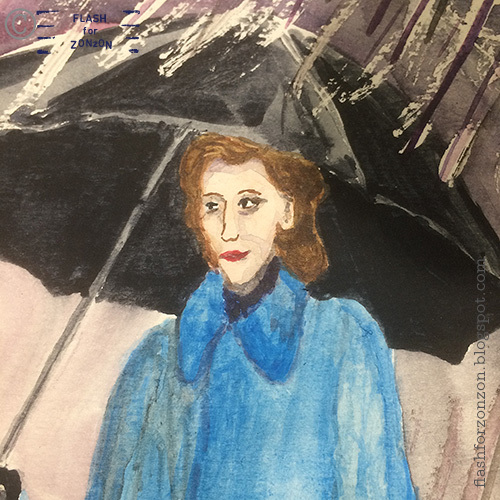 Besides streets my drawing subjects come from the Internet, and magazines. Drawing is a delight. I hope you enjoy! Feel free to comment in english or finnish = suomeksi. I read swedish and spanish too. And in addition we always have the Google-translator. The Story of Blue Suede Shoes. My Style. These Boots Are Made for Walkin'. Catwalk. Chanel Pre-Fall 2013 Goes Saint Lucia. Seasons. June, Helsinki Samba Carnaval 2013. On the street. Dog-like Style, Lauttasaari, Helsinki. Seasons. June, Helsinki Samba Carnaval 2014. Catwalk. Junya Watanabe Men, Fall/Winter 2013. On the Street. Grey Suit With Color Spices, Museum of Sports, Helsinki. 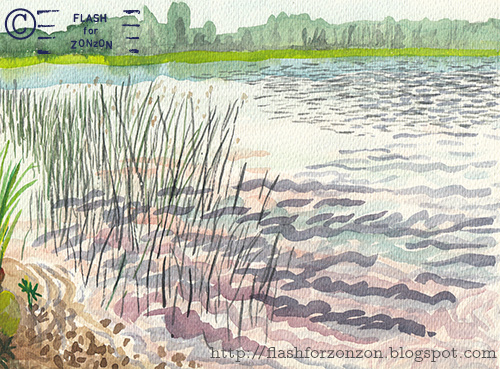 THIS ENTIRE SITE Ⓒ FLASH FOR ZONZON. Simple theme. Powered by Blogger.